When we think about farming, most of us think about huge pieces of equipment and large rolling fields. 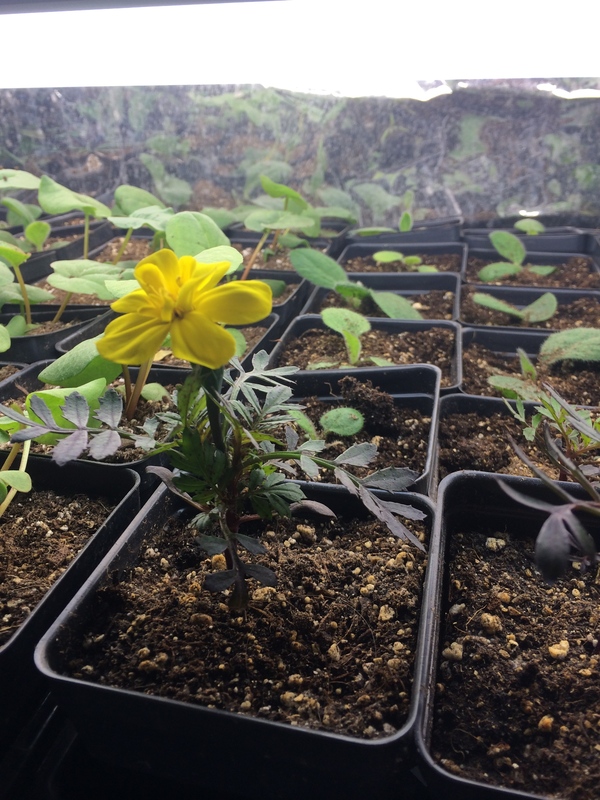 Things are different on a small scale vegetable farm. We do use machinery, but it’s adapted to our size and needs. This spring we purchased a BCS Tractor. It’s a European style tractor that has two wheels and a PTO that can interchange a tiller, root digger, and a rotary plow. Plus, many, many, many, more attachments. This allows us to use succession planting in a more efficient way because we are able to get our tractor in between beds that are already planted and growing. Here’s Jeremiah using the BCS with the tiller attachment to till his mom’s garden. Please ignore the coloring–I hit a weird filter on my camera. 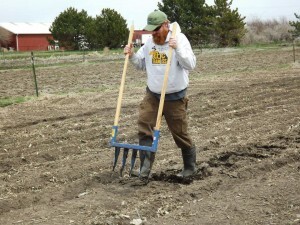 Another way to prepare the soil for planting is to use a broadfork. Jeremiah is very good at this. He loves it…so much? The broadfork breaks up the soil without turning it to allow the roots of plants to grow deeper. What about weeding? Oh, so many tools can be used! 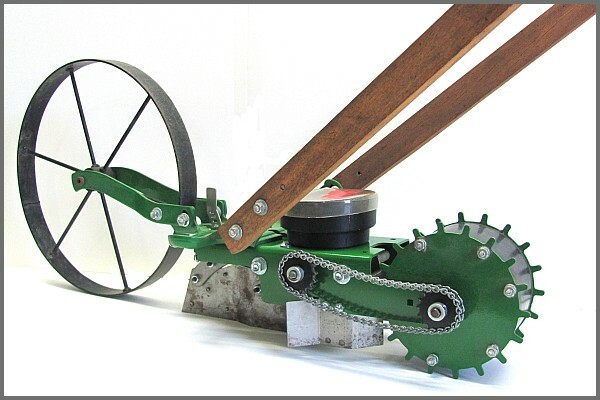 Our favorite is the Valley Oak Wheel Hoe which makes weeding so much easier! 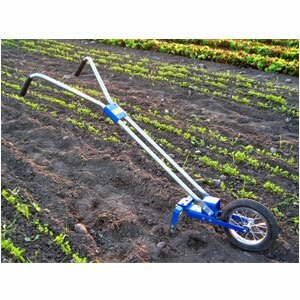 It has an eight inch blade that cuts the weeds just under the surface of the soil without disturbing everything else. We also have a claw attachment, a hiller, and a larger blade. This year, we were able to find a Hoss Seeder that will attach to our wheel hoe and help us direct seed plants such as: spinach, lettuces, beets, radishes, turnips, and more. 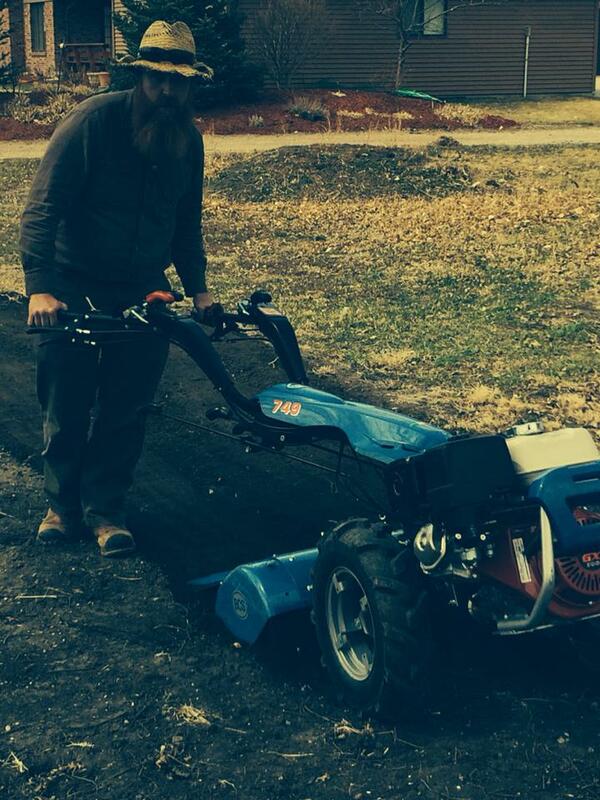 It’s pretty heavy duty and we think it will help us make fabulous straight lines and perfectly planted rows! Imagine this on our wheel hoe! We can’t wait to try it out! Sometimes, the wheel hoe is just too big to get between plants–or usually, Kate has planted them too close, and we need to use a hand hoe to get between delicate plants, like kale and onions so we use a traditional hand hoe or a wire weeder and the list goes on! For harvesting we use a variety of specialized cutting tools, bins, and carrying equipment. They’ll be more information on that as the season chugs along! 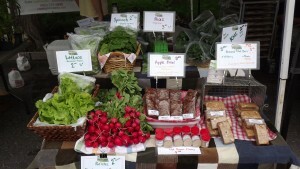 We really enjoyed participating in Open Harvest’s CSA Fair on March 8th. We had a great time enjoying the warm sunshine and talking with veggie lovers. 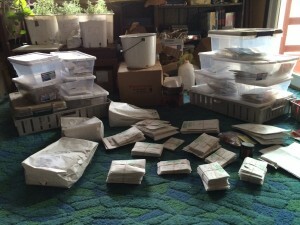 On March 5th our seed order arrived! Hip! Hip! Hooray! and a little bit of Yikes! There were A LOT OF SEED PACKETS! But the excitement of the new varieties got us going! That was the mess that Kate organized two weeks ago, so that we are a bit more efficient in our planting and overall, just making life a little bit easier! 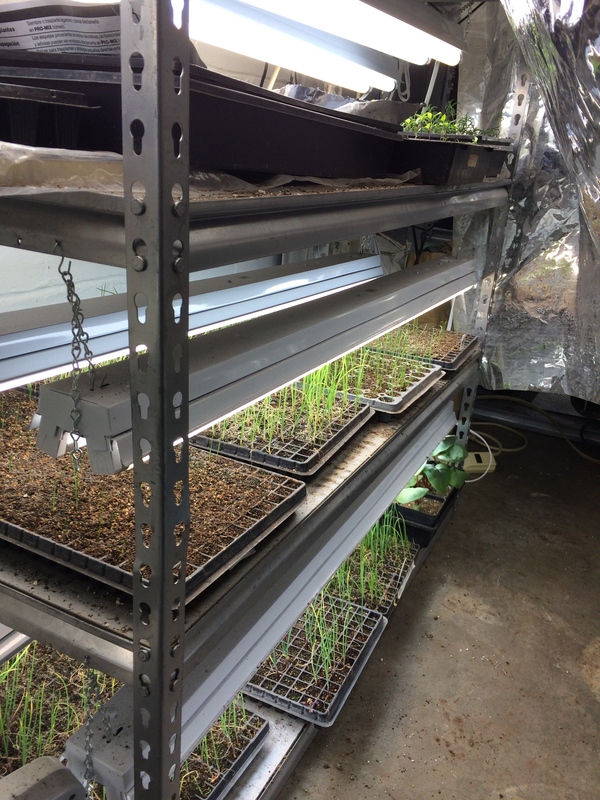 The plants in the basement are growing, germinating, and generally happy. Our first Marigold has bloomed a bright yellow flower! Even though the snow is still on the ground, we have been working on our farm for more than two months. It may seem like we get a break during the winter months, but only between Thanksgiving and Christmas…and sometimes we extend that to New Year’s. 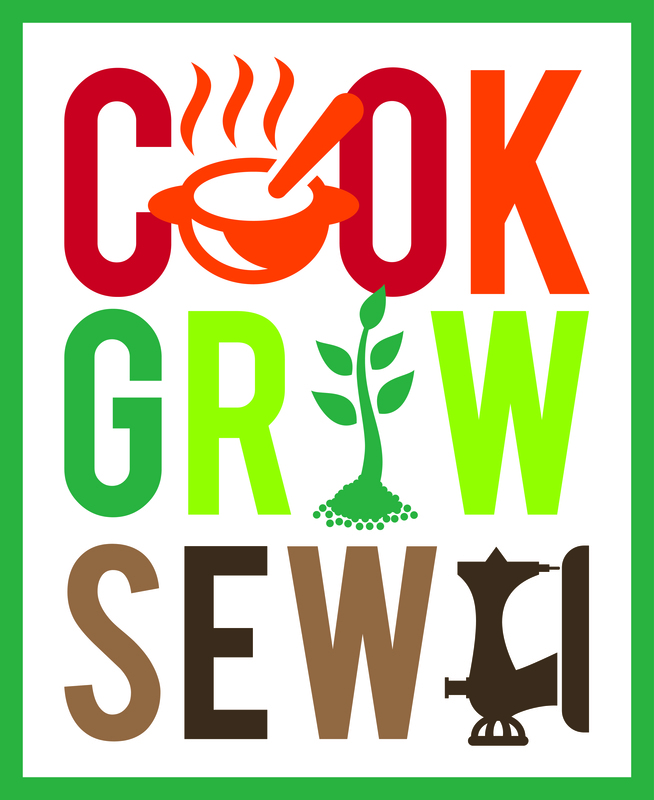 As Valentine’s Day approaches, many exciting things have been happening at Cook Grow Sew. 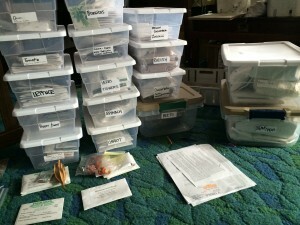 We are finalizing our seed order (We LOVE our seed catalogues!) and it’s very hard to choose all of the heirloom varieties that we want to grow! There are SO MANY to pick from. We weigh what our customers want, as well as, what new varieties of popular vegetables we can grow. Farmer’s Market applications are also due quite soon, so we have to figure out where we can spend our time and how we can best reach our existing and new customers. It may not seem like a lot, but it truly is. We care about our customers and our land, so it’s quite the task. It’s starting to warm up out here in Nebraska. I know it feels like ages away, but it’s true…Spring is on the way! It’s time to start thinking about why a CSA is good for you and your family. There are many CSAs to join around the Lincoln area, and even though it may seem daunting to join one, it’s a great challenge. At Cook Grow Sew, Jeremiah and I strive to help you discover new vegetables and ways to enjoy them. We’ve had many a customer hesitant to try something new to them (or even something they didn’t care for as a child) and come back the next week saying how much they enjoyed trying new produce–“it tastes better,” and “I had no idea I liked it!” were familiar responses. We provide recipes for new vegetables and detailed information about uncommon varieties and uncommon vegetables. Cooking for your family, whether a family of 5 or a family of 2, can seem daunting, but with a little practice and a conversation with your farmer can become second nature. We grow these vegetables because we love to eat all of them! From suggesting adding chopped up Kale to spaghetti sauce, to seemingly complicated soups and ways to store your produce for winter cooking, we can help you become a wonderful part-time chef. Joining a CSAs brings you closer to your food and knowing your food is grown in a way that makes you proud to feed your family will satisfy you in ways you never thought of before. We are here to answer any and all questions and love to chat with our customers. Each week, you will look forward to our emailed newsletters describing the delicious treats in your box–and it’s all for you. Sometimes, busy weeks come about, but feel free to share those extra radishes or squash with a neighbor or a family friend–they will enjoy them as much as you! The best part is that the growing seasons ease you into cooking. 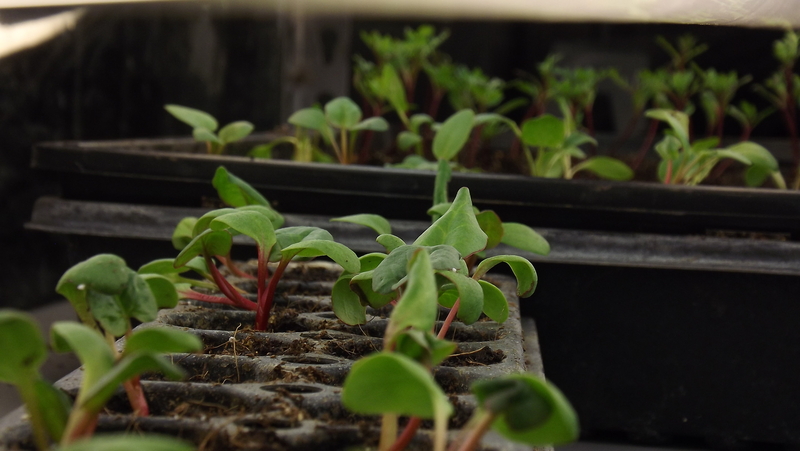 Spring starts with radishes, beets, and lots of greens for a few weeks, with new vegetables slowly entering the mix. In the height of July and August you will see lots of tomatoes, sweet and hot peppers, onions, eggplant, and zucchini. Fall brings about more squashes and the cooler weather brings about the lettuces and cool weather crops like turnips, beets, and radishes. By the time you start to feel overwhelmed, your new skills and tastes will propel you into the Fall and all of the sudden the season will end and you will be more than excited to find that frozen bag of roasted tomatoes you put up in the summer to make a delicious meal as the snow flies in December. Nothing compares to fresh and local produce prepared for your family and we look forward to being the farmers that bring that love to your table! 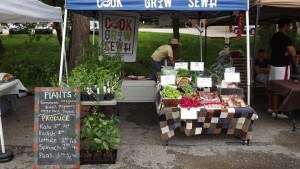 Even though the weather is still quite chilly and windy, things are getting started here at Cook Grow Sew. Jeremiah has diligently planted over a thousand teeny tiny onion seeds, rhubarb, and even some marigolds. Above are little rhubarb plants. We’re strongly thinking about turning a large portion of our front yard into a rhubarb patch! And here our our little onions! They are already quite tall! 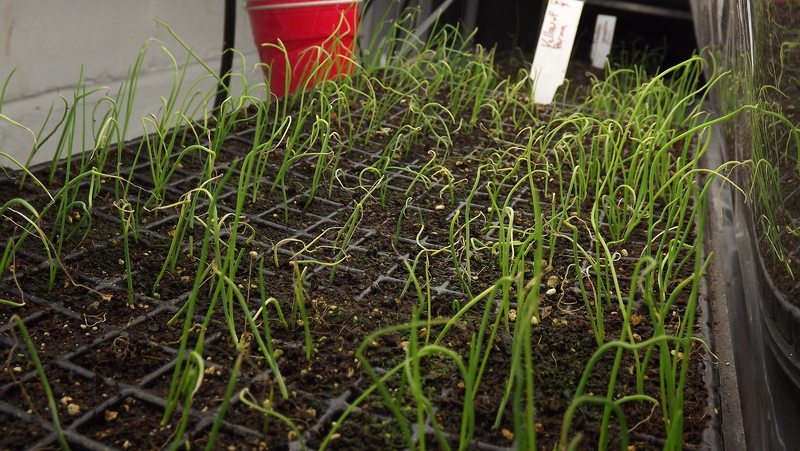 We love onions and look forward to lots and lots of them this coming year. 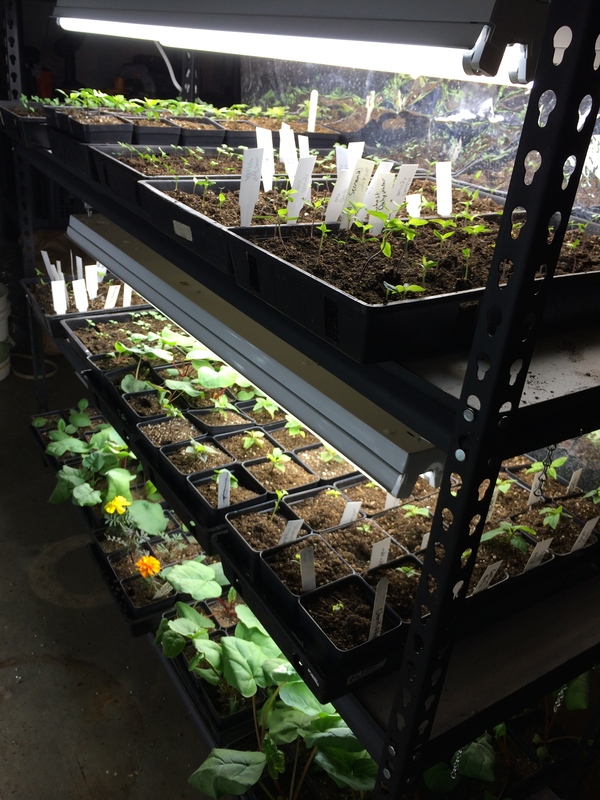 At the moment, we are working on our CSA plan so that we plant the right amount of vegetables on the right day to ensure that we’ll have a great variety for our members. We have to be as prepared as possible because Mother Nature often has other plans! Last year was our first year growing for a CSA and it was quite the learning experience. For us, it was making sure we had variety, quality, and quantity. We sure enjoyed talking with our members, offering cooking and storing advice, and learning about how they used their fresh veggies. A box a week of vegetables can sound quite overwhelming, but each week, we sent our members a newsletter that explained the varieties in their boxes, included recipes, as well as storage tips. We learned that our vegetables lasted quite a bit longer than many people were used to. We pick our vegetables less than 24 hours (and usually only 8 hours) before they are washed, bunched, and packed into the CSA boxes. That sure beats many stores in quality! A lot of times, grocery stores are placing produce out over a week after it has been picked. No wonder fresh greens don’t last more than a few days! It’s time to get back to work on the paper side of our farm and we hope if you have any questions at all you’ll send us an email at cookgrowsew@gmail.com or give us a call 402-370-5898. It’s a new year, with new goals, new ideas, new this and new that. It’s also when the two of us recover from the various doings of the Holiday season and start anticipating the spring. Which means….”There’s a lot of work to dooooo!” Oh, Johnny Appleseed, I sing that mantra all year long and I can hear it whispering in the back of my mind like the quiet start of a 10-month symphony. The new year means planning, sorting, and more planning. 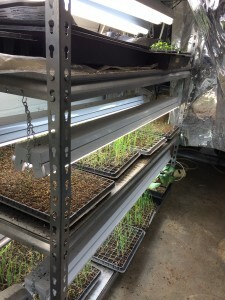 Planning crops–where should they go and how many to support our demand at market and our CSA, planning time, adding new ideas, changing this, and improving that. We’re expanding our CSA and moving up to a full acre of land next year. I can’t believe how much food we grew on just half an acre of land! It’s easy to think of one acre as about 75% of a football field, including end zones. So we grew all that on 37% of a football field! We supported more than 20 families through our CSA with an average of 10-12lbs of produce each week for 20 weeks as well as numerous families through the Old Cheney Road Farmers Market and the Uni Place Market. That can only happen with proper planning, diligence, and great weather, too! We’re also adding an egg, cheese, and grass-fed ground beef add-on for our CSA Members! How exciting…and delicious! Our pastured eggs will come from Vern Jantzen in Beatrice, the cheese is from Branched Oak Farms and our grass-fed ground beef from Davey Road Ranch both in Lincoln. We’re getting back to work on our plans and much more. You enjoy the end of winter and the beginnings of spring and we’ll see you soon! July roared in after the Fourth with an abundance of hot, humid, sticky and altogether unpleasant weather. This is the time of year when nothing sounds good to eat but fresh vegetables. Thank goodness for that! It’s the hot summer days that make me not want to eat a lot of cooked meals. So what does one hungry farmer feed her very hungry other half who’s been slaving away in the heat working too hard for his own good? That’s a question that will plague me for the rest of the summer, but has also inspired me to ask my dear friend Google. I might even delve into the cold soups this year…? We’ll see. The sun is slowly rising and there is a crisp feel to a new day dawning. The birds are chirping and the wind rustles the leaves of the trees over a quiet parking lot. As we pull into the Old Cheney Road Farmer’s Market vending space, two and half hours before the market opens, there are only two stalls with their tents up. We find our spot and start to unload our coolers, tent, chalkboard, sign, baskets, and tables. Soon, there will be a bustle of activity as each farmer gently sets up their produce, pops up their tent, and organizes the vast amount of vegetables in an eye catching way. Each week, dozens of farmer’s spend countless hours weeding, mulching, planting, and taking endless care of their fields. It takes a lot of behind the scenes work that can go unnoticed to the casual consumer. Lettuce is picked in the very early dawn hours, usually by headlamp, carefully sprayed with clean water, and then dunked into another tank to remove any remaning dirt (and the occasional pieces of grass) and then whirled around in an extra large salad spinner before it is carefully placed in a cooler. 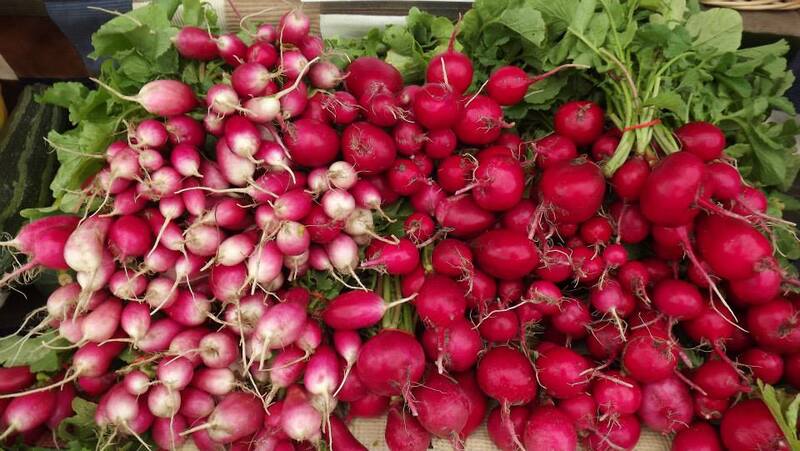 Radishes are picked and sprayed and oftentimes scrubbed a little to removed dirt and then artfully bunched. Kale is spritzed, sprayed, dunked, and spun. Tomatoes are sprayed and dried. 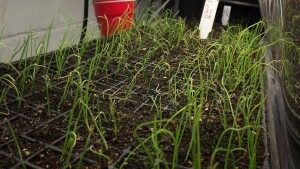 Garlic scapes are delicately trimmed and bunched. The list goes on and on. Many a Saturday night, after picking our produce in the cool of the evening, we are in our driveway, dunking, spinning, and spraying until the wee hours of the morning. And somehow, we each manage to work forty or more hours a week at a day job. More farmers (I should say friends really–we share a strong common bond) arrive and the parking lot starts to sound more like a bee hive buzzing along merrily. Many a hello and good morning are exchanged with a cup of coffee in one hand and head of lettuce in the other–and always a smile. So many questions are running through our heads. “Should we put the Kale over by the lettuce?” “Are the radishes in a good spot and easy to see?” “Run across the way to Quail Acres and ask Robert how he keeps his Swiss Chard looking so great all through market.” “Let’s put the scale over here. Wait, it’ll be easier to use over here.” A lot of our questions have to do with pricing; we want to sell our produce for what we believe it’s value is, but we also want to stay within a similar range as other farms. The behind the scenes flurry is in full swing in the last half hour of set up. Farmers and producers are walking quickly back and forth as the early shoppers start to stroll through. It’s nerve-wracking as we hope we can get everything set up and looking great before the whistle blows. There’s always last minute changes in our booth as we rearrange our produce, change our signs and use the space to our best advantage. The anticipation and pride starts to set in as we see people admiring our carefully grown harvest. Nothing beats the feeling when the whistle blows and that first bunch of radishes is snatched up. The market really hits full swing as more and more people cross the bridge. We try to say hello to everyone who’s passing by and chat with our weekly customers and make new friends. Many a laugh is exchanged as we explain how we grow without any pesticides and unfortunately this week our Arugula is a little hole-y than we’d like, but it’ll still taste great. I guess that’s why it stung a bit when I heard the lady stop in front of our tent and whisper to her husband, “I can get Kale at Super-Saver for 75 cents cheaper,” and walk off. It was an innocuous sentence, really, but it stung much more than I expected. I just looked at Jeremiah quizzically. “Did she really just say that?” Obviously, it’s still bothering me a bit today as I write this, but the more I think about it, the more I realize that she just didn’t know the difference between supermarket produce and farmer’s market produce. It made me sad. Yes, I realize I’m invested emotionally in my Kale, but there are strong reasons for that investment: It tastes better and is healthier. It’s chemical free. It was picked less than 12 hours ago. It’s from Lincoln. I GREW IT! But most of all, the reason that this entire market exists is because we believe in a healthier and local way of supplementing our diet. I’ve only been exposed to this way of thinking for a few years now. It takes more effort to change your habits and do things a bit off the beaten path, it’s not easy, and people can look at you funny, but it’s worth it. Shopping is easier when you go to a large superstore and can get all the things you need (I feel that is a relative term) in one single location, but you are sacrificing a lot of things for that convenience. That’s why we encourage each and everyone to grow a small garden, in buckets, in pots, anything. Grow! Grow! Grow! See what it’s like to grow a plant from a seedling and how nature takes it’s course (and time) to produce sweet tasting tomatoes and luscious basil. Any and all ways we can encourage people to THINK about where their food comes from, how it’s produced, and who grows it. It can be an eye opening experience. By no means are we perfect, but we sure attempt to cook every night and if we are extra tired or rushed we eat from local establishments, because working 40 hours and running a half acre farm doesn’t leave very much time. But I do know I sure feel 25 times better when I eat fresh food than anything that is processed. I related to that lady in a way, I know what it feels like to save extra cents on food, but if it was really about the 75 cents, I pitied that lady. If her budget was tight, I would have been more than happy to help her out with some Kale this week. But what do I know? I can’t change the world, but I can keep doing what I’m doing. And so, I got back to happily selling my green goodies. “Gorgeous heads of lettuce,” commented a passerby, and with a heartfelt “Thank You!” I replied, once again feeling good. As the first fresh greens start coming into our home, we can start to feel overwhelmed. Lettuce, Kale, Kohlrabi, Spinach, Swiss Chard, Radishes, Beets, Pak Choi, Asparagus, and so many more. Our brains go into overdrive. “How do I use all of these delicious vegetables?” “How do you eat it?” And, oftentimes, “What is this?” We’ve all been there and that’s the fun of visiting Farmers’ Markets and participating in a CSA–you get new and interesting vegetables. Unfortunately, there are only so many salads you can eat in a week. I’m the type of gal who sticks to the staples in the kitchen. I like to make spaghetti, grill steak with a veggie side dish and a starch, or eat a BLT. The farthest I usually get from the norm is making a biscuit crust and tomato, basil pesto pie. This is not the case when you live with Jeremiah. He loves variety and throwing a hodgepodge dinner together. When he’s making dinner, I never know what to expect except for one thing: it will be delicious. By osmosis, I have slowly been gravitating towards cooking without a recipe. It’s not always easy, and believe me, I still always search for a recipe to get me started. So, with all that rambling, I guess the lesson is: don’t be afraid. If you like the ingredients, could it really turn out that badly? Just go for it. Find a few recipes on the internet that you like and mix and match them. Be bold. Be brave. Your stomach and family will love you! The days are getting longer and the weather is getting warmer, maybe? It seems that Nebraska’s weather is always going to be throwing us for a loop. Highs and lows that make it very difficult for a farmer to know when to do anything. 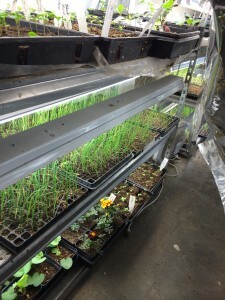 We has been moving forward with a mad rush to plant stuff in the ground, much to our delight it is growing as well. Our field is about full and it appears we will need to expand next year. So far we have planted lots of spinach, chard, kale, lettuce, radicchio, mizuna, mustard greens, sorrel, pak choy, broccoli, cabbage, brussel sprouts, corn, tomatoes, peas, beans, radishes, beets, cucumbers, summer squash, winter squash, basil, oregano, cilantro, cucumbers, carrots, potatoes, onions and leeks. I am sure i am missing something here and there is more to be planted. 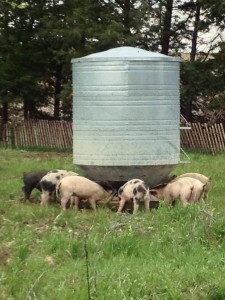 At least the pigs are happy with the weather. They are out on pasture all the time and have shelter available to them if they need it. Getting fat and being happy is the best thing ever for a pig. 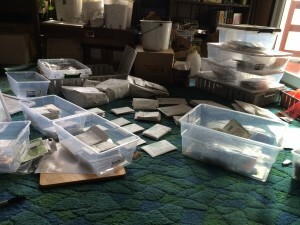 Margo and Zack have some great things to say about their experiences on their blog.